The historic seacoast town of Marblehead, Massachusetts is privileged to have in its midst one of the finest late colonial homes in America. A flourishing seaport, colonial marblehead was about the tenth largest in Britain’s North American colonies just before the Revolution and the second largest town in Massachusetts. The downtown area includes nearly 300 houses built before 1775 – the largest concentration on this continent, along with Newport, RI – and nearly 800 built before 1840. The mansion built in 1766-68 for Colonel Jeremiah Lee, the most affluent merchant in the province at that time, was one of the largest and most elaborately decorated homes of its time in America, and still retains nearly all of its original structural elements and most of its original decorative finishes. These include intricate woodwork carving in the rococo style and a soaring central stair-hall lined with mahogany wainscoting that is unique in its use as an opulent wall treatment, and two sets of rare original mid-18th century wallpapers: a block-printed pattern with Chinese scenes (the only example of that type still on the walls of its original home) and a set of magnificent hand-painted English grissaille mural papers that were unusual at that time and are the only such wall treatments in the world surviving in place. (The other surviving set is one of only two others known from that time, both formerly in homes in Albany, NY; it is installed in the Metropolitan Museum of Art’s American Wing.) Emulating an aristocratic English mansion built of stone, all four facades of the Lee Mansion are faced with long wooden facing boards, 10” tall, with long beveled edges and vertical scores every two feet that visually simulated cut stone ashlar blocks. To further suggest the appearance and texture of stone, grains of sand in colors ranging from black to almost clear were thrown or ‘strewn’ onto the surface of the paint while still wet, creating a rough surface that would sparkle in the sunlight like cut stone. 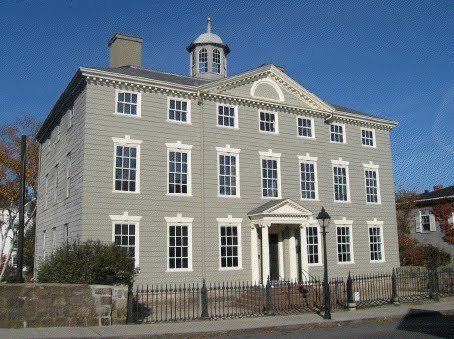 The grand residence was visited in 1789 by General George Washington during his inaugural tour of New England. 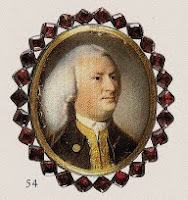 Newly elected as the nation’s first President, the Revolutionary War leader came “out of [his] way” to Marblehead to thank the townspeople for their service and inordinate sacrifice during the war, which left the maritime town economically devastated, with failed businesses and nearly 500 widows. The Mansion was preserved because after 1775, no families owned it to make changes, and for a full century it was a bank and commercial office building before the Marblehead Historical Society purchased it in 1909. The Mansion comprises over 10,000 square feet of living space in 18 rooms. All but one are open to the public. They are filled with a museum-quality collection of 18th and early 19th-century decorative arts, paintings and artifacts with Marblehead history and connections. Visitors are captivated by the Mansion’s striking appearance, the magnificent painted wallpapers, the high-quality collection on display, and Col. Lee’s intriguing story.